Noted for: Bugs Bunny, Daffy Duck, Porky Pig, Woody Woodpecker, Barney Rubble, etc. etc. practice voices. Among them was a style of laughter, previously unheard in this world. Today, we're all familiar with that laugh — in 1940, it became the trademark of Woody Woodpecker. The amazingly versatile voice actor was responsible for a lot more characters than just Woody. Others of that approximate vintage include Daffy Duck, Foghorn Leghorn, Sylvester Pussycat and of course, Bugs Bunny. On radio, Blanc's roles included Pancho (The Cisco Kid's sidekick), Sad Sack, and Jack Benny's ancient automobile. It would not be much of an exaggeration to state that Mel Blanc invented the profession of cartoon voice acting. Before 1936, when he joined Warner Bros., voices tended to be done by whoever happened to be handy. Popeye, for example, was voiced by animator Jack Mercer, and Mickey Mouse, at first, by Walt Disney himself. But, tho he did a little "face acting" and a little music making, Blanc was mainly a voice man — and the very first to receive screen credit in that capacity. Director Bob Clampett, creator of Tweety Bird, Beany & Cecil and others, credited Blanc with having raised the standards of animation art, by showing them all what the form was capable of. Melvin Jerome Blank was born May 30, 1908, in San Francisco, and grew up in Portland, OR. (He changed the spelling of his last name at age 16.) He showed an early interest in the sounds of people's voices, studying and practicing the various accents of his ethnic neighbors and playing them back to his teachers and classmates in the form of jokes. This gave him a taste for applause, and set him on the road to fame. Immediately upon graduating high school, he got a steady gig on a local radio show, "The Hoot Owls". It was the first of several jobs in radio and vaudeville. Right about when the movies were starting to talk, he lit out for Hollywood. There followed several years of struggle (including a two-year return to Portland), but eventually, Blanc started getting regular work in radio. But what really got his career going was a stuttering pig named Porky. After a year and a half of regularly applying for voice work at Warner, only to be rebuffed at the door over and over by the same condescending jerk, Blanc got a break when the condescending jerk suddenly died. The moment he got in the door, and directors actually heard his audition material, he was in. The first cartoon to feature his vocal work was Picador Porky, directed by Tex Avery and released March 13, 1937. Mel Blanc did them all — even the characteristic "Meep Meep" of The Road Runner. For decades to come, he was the one man most closely associated, in the hearts and minds of the public, with the Warner Bros. cartoon stars. And those weren't the only ones — aside from his 1940s work on Woody Woodpecker, he also voiced dozens of Hanna-Barbera characters, starting in 1960 with Barney Rubble of The Flintstones. Just as he gave those characters life, in a sense, they returned life to him. In 1961, following a near-fatal car accident, a doctor, acting on sudden inspiration, managed to cajole him out of a two-week coma by addressing him as Bugs Bunny and Porky Pig. When Blanc did wake from that coma, he found over 15,000 get well cards waiting for him, from all over the world. Some, in fact, had managed to reach him with no more address than "Bugs Bunny, Hollywood, USA." Text ©2001-06 Donald D. Markstein. 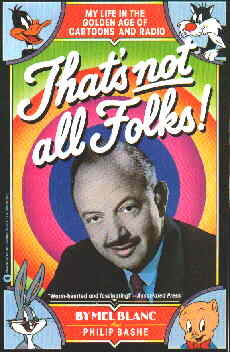 Art © Mel Blanc estate.